Earth building and rammed earth have very low carbon emissions. However there is a confusion between rammed earth, a mix of clay, sand and stones, and dry pack concrete, too often called stabilised rammed earth. For this reason some discussion about cement, what it is and it's emissions are discussed below. 2015 saw cement production globally at 4.2 billion tonnes. According to the Intergovernmental Panel on Climate Change, IPCC, for every tonne of cement produced there is a one and a quarter tonnes equivalent of CO2 released. 4.2 billion tonnes of cement multiplied by 1.25 tonnes of CO2 per tonne of cement produced gives an eye watering 5.2 billion tonnes of CO2 emitted from cement production in 2015. 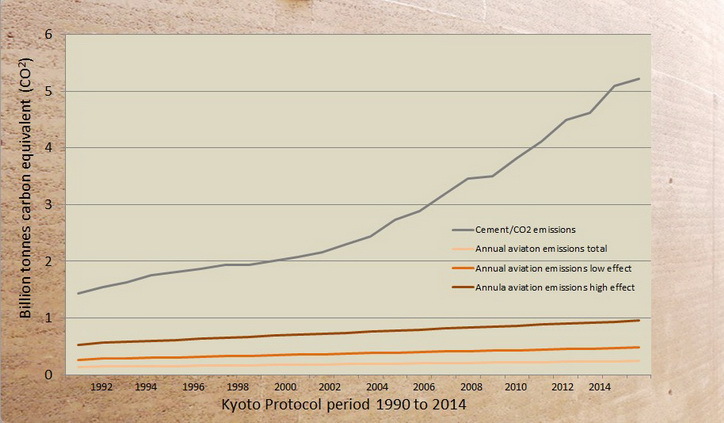 In the same year total CO2 emissions from human sources was 36 billion tonnes. This puts carbon emissions from cement just under 10% of all human emissions, and growing. some of the fastest growing human impact. The reason one tonne of cement produces 1.25 tonnes of CO2 comes from two sources. First the limestone which is burned to make cement is more than twice the density of water and has to be heated to 1,450 degrees C, which uses a lot of fossil fuel, about .75 tonnes per tonne of cement. Second to the energy load to heat the limestone, the stone itself is composed of calcium and carbon. To make cement the extremely stable carbon, the living part of the creatures whose remains make up the limestone, has to be made into CO2. In this way we have made two sources of very stable fossilised carbon into a huge amount of CO2. In doing this for the last 100 years we have produced a global construction sector which is now entirely client to the cement industry. Through legislation cement has become a monopoly material throughout the world, and for increasingly minor structures. Not only has cement dominated the legislative and codified areas of construction, it has dominated education in the professions and trades too. Most engineers know nothing of any other form of construction, and as we are driven by an increasingly style oriented architecture the results are ever heavier burdens of pollution. Other misconceptions about cement include its longevity. Not only has concrete cancer been identified as a big killer of concrete structures, users also destroy buildings with the same lack of concern over their consumerist values as with all other forms of consumption and waste. The difference is that cement has such a high burden of embedded energy that is not justified by a short life of even a hundred years. So much modern building is destroyed through internal faults or changes in use or fashion.